Want to compare hard disk performance or see just how big of a speed difference that SSD upgrade had? 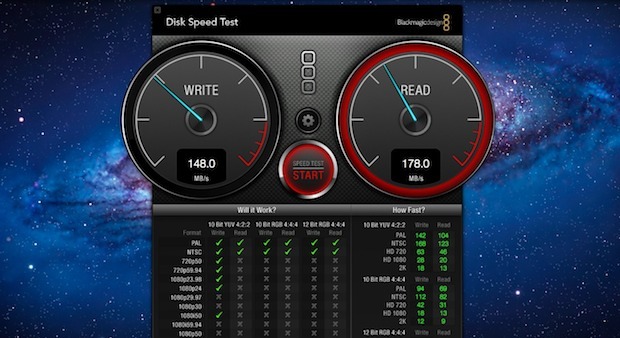 Grab the free Disk Speed Test tool from the Mac App Store, it’s a quick and simple way to measure drive performance. The app works by creating large blocks of temporary data that are written to the drive and then read, allowing for a consistent benchmark across multiple Macs or disks. The UI is easy to understand and there’s no frills, just launch the app and the test starts. It’s not exactly scientific, but it’ll give you a good idea of performance changes with upgrades or different disks, just note the read and write speeds both before and after an upgrade, or have your friends run it on their Mac to test speeds across drives. For example, a MacBook Air might write to an SSD at around 180mb/sec and read at 220mb/sec, whereas a standard 5400 RPM drive in a MacBook Pro may only write at 45mb/sec and read at 60mb/sec. Many third party SSD’s perform even better than the MacBook Air, and these kind of numbers really drive home the day-to-day performance boost you’ll see with an SSD upgrade. If you’re in the market for one, check out the deals on SSD drives at Amazon and get yourself an early Christmas present. 260/240 read/write. Woo woo SSD FTW! 200 read and 180 write with a new MacBook Air. Very fast, no complaints. I tested the 256GB SSD that I installed in my 2009 MBP…. seems to write at 179 and reads at 237. One of my favorite upgrades ever!! 70 Read, 70 Write on a mid 2010 MBP, I need a freaking SSD. I tested the 256GB OWC Mercury EXTREME Pro SSD 3G that I installed in my 17-inch, Early 2009 macbookpro and seems to write at about 95 and reads at 200.
james what ssd install ? Click the preference button in the center of the window to choose your disk, then while in the browser choose your desktop. Now you should be able to run the test! I’d be curious to see an SSD in my Mac Pro. Never going back to HDD ever again. bit of a disappointing 160MB/s on write, but 480.3MB/s read. Vertex Agility 3 in a Macbook Pro. what are good numbers? ie what should I be seeing? is 160 a diss appointing write?? Nice improvement tho. Negotiated link speed is 150 MB/s. Anything I can do to max out the speed? I was expecting faster speeds, any suggestions? Not fantastic numbers, but not bad considering it’s a VM. Hope this is useful information, in some way.